The newly-restored HH-52A 1426 is unveiled during a ceremony at Aviation Logistics Center in Elizabeth City, N.C., Friday, Dec. 11, 2015. Human flight is inherently amazing. For people looking to satisfy their wonder, or to simply bask in astonishment at accomplishments in the history of aviation, there’s no better place than the Udvar-Hazy Center in Chantilly, Virginia. The museum includes representative aircraft from every U.S. military branch, with the exception of one — the U.S. Coast Guard. The life-saving service famous for hoisting survivors at sea to its helicopters doesn’t yet have one on display there, though that’s about to change. 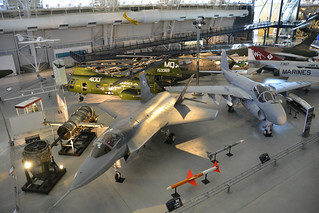 The companion facility to the Smithsonian National Air and Space Museum in Washington, the center includes two enormous hangars — the Boeing Aviation Hangar and the James S. McDonnell Space Hangar — where visitors can find thousands of aviation and space artifacts that tell fascinating stories of women and men taking to the skies and stars. Visitors stand awed before sights like the actual B-29 Enola Gay, the first aircraft to drop an atomic bomb, and the space shuttle Discovery, world record holder for most spaceflights. U.S. military aircraft are on display at the Udvar-Hazy Center in Chantilly, Virginia, the companion facility to the Smithsonian National Air and Space Museum in Washington. Soon to join the ranks of these relics is the Coast Guard HH-52A Seaguard helicopter, tail number 1426. Like many of its soon-to-be museum counterparts, the 1426 was an aircraft piloted in the performance of famous feats. What makes it so special, like the service it represents, is the missions it performed saving peoples’ lives. One particular mission performed by a 1426 crew stands out not only as one of the greatest for that airframe, but perhaps in Coast Guard aviation history. On the morning of Nov. 1, 1979, then Lt. j.g. Chris Kilgore and Lt. J.C. Cobb, both pilots, along with Petty Officer 2nd Class Thomas Wynn, an aviation electrician’s mate, rescued 22 survivors from the burning tanker Burmah Agate and freighter Mimosa after the two vessels collided near Galveston, Texas. Burmah Agate was fully loaded with fuel, and the collision resulted in an explosion that ignited leaking oil. The tanker went down soon after the collision, while the burning Mimosa remained underway, slowly circling around a dropped anchor. The 1426 crew was one of two helicopter crews from Coast Guard Air Station Houston to respond and hoist survivors from the ships. A memoir of the famous case titled “Just in Time,” written by 1426 co-pilot Kilgore, details his firsthand account of what the rescuers faced that day. He wrote of explosions, intense heat from the fire, turbulent air, taking on survivors until the helicopter exceeded its maximum allowable weight — and dropping them off on a nearby oil platform before returning to rescue more. 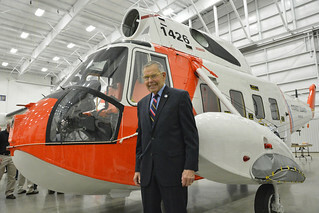 Retired Rear Adm. Robert Johanson stands before HH-52A Seaguard helicopter, tail number 1426, at Coast Guard Aviation Logistics Center in Elizabeth City, N.C., Friday, Dec. 11, 2015. The Coast Guard will be represented by the 1426 in perhaps the best possible location for reaching a national audience interested in aviation history, hosting more than 1.4 million visitors so far in 2015 alone. The helicopter is scheduled to become a permanent exhibit at the museum in the spring of 2016 – a highly-anticipated event for both the Coast Guard and the Smithsonian, which coincides with the centennial anniversary of Coast Guard aviation. “The arrival of the 1426 and its subsequent display in the museum presents not only an opportunity to demonstrate the importance of Coast Guard aviation to American life, but to illustrate the role of the helicopter and what it can do for humanity in general,” said Roger Connor, museum specialist and curator of the vertical flight collection. HH-52s, the first amphibious helicopters, were last flown by the Coast Guard Sept. 12, 1989. The legendary helicopters’ success made rotary-wing aircraft central to Coast Guard aviation missions during the airframe’s 26 years of service. 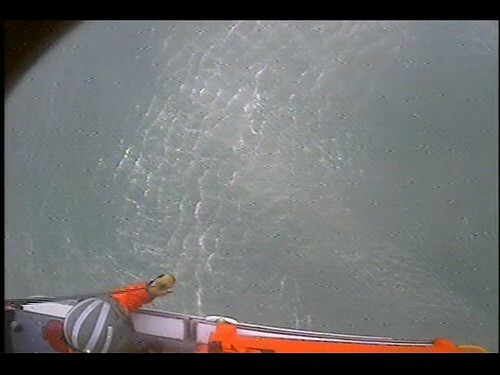 In all, Coast Guard HH-52A crews saved more than 15,000 lives. Retired Rear Adm. Robert Johanson discusses Project Phoenix in Annapolis, Md., Thursday, Dec. 3, 2015. The driving force behind placing one of these magnificent machines in the Smithsonian is a collection of dedicated Coast Guard aviators, many whose careers involved flying one. These dedicated people worked tirelessly behind the scenes over the past decade, giving generously their time and resources. The Coast Guard Aviation Association (CGAA), known also as the Ancient Order of the Pterodactyl, is dedicated to preserving U.S. Coast Guard aviation history, as well as camaraderie among the former and current Coast Guard aviators who make up its majority. In 2005, then CGAA president, retired Capt. 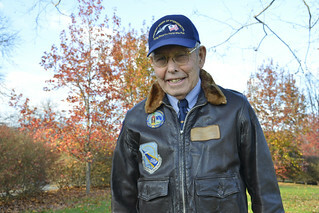 George Krietmeyer initiated the idea to locate, acquire and restore an HH-52A Seaguard helicopter for display in the Smithsonian. 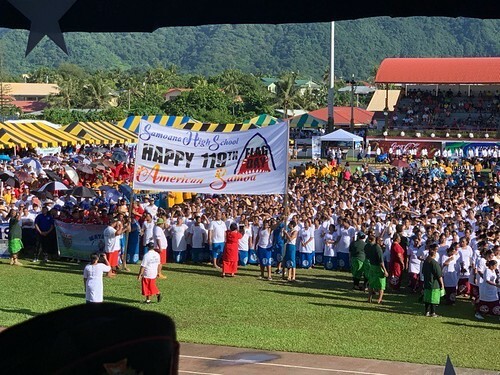 The resulting effort was later named “Project Phoenix” by retired Capt. Tom King — a metaphor comparing the helicopter to the once beautiful bird rising from ashes and obtaining new life. 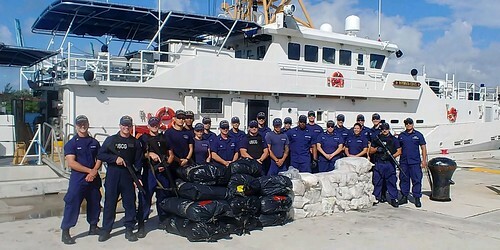 The project involved numerous CGAA volunteers and active-duty Coast Guard leaders who are quick to credit others for the project’s success, including retired Rear Adm. Robert Johanson. Ask anyone and they’ll tell you he’s been the backbone of the initiative from its conception. Reluctant to accept recognition, Johanson has a sense of humor on par with his drive for making things happen. “I’m just glad to know there’s a Coast Guard helicopter going into the Smithsonian while I’m still on the right side of the grass,” he joked. Locating a structurally-sound Seaguard helicopter suitable for museum-quality restoration was the first necessary step in what would become a decade-long project. The CGAA identified several candidates over the years, acquiring three HH-52s from the Aberdeen Proving Ground, a U.S. Army facility in Aberdeen, Maryland. The helicopters ultimately did not make the cut, though some of their parts were eventually used to restore the selected Phoenix. The road to finding the ideal bird came to a few dead ends along the way, but that didn’t stop Johanson and his fellow Pterodactyls, led by then CGAA president, retired Capt. Mont Smith, from persisting. Who needed roads? These were men used to flying. 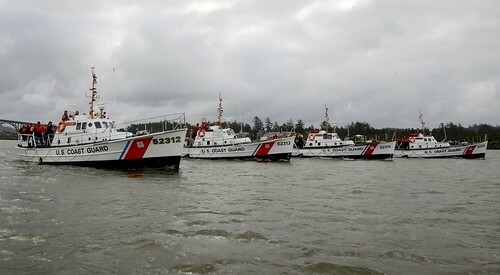 Overcoming various legal challenges that restricted funding and limited human resources for the project, the CGAA did the majority of the leg work while active duty Coast Guardsmen who were crucial to the project were primarily focused on day-to-day operations. At times, it seemed the service didn’t have the time or manpower to see the project to its end. Still the Pterodactyls persisted, working patiently with changing Coast Guard leadership, forging ahead with ways to make it work. Finally, in 2012, the Pterodactyls soared into promising skies as a museum-quality helicopter was identified at the North Valley Occupational Center in Van Nuys, California. The HH-52A Seaguard 1426 was donated by the Coast Guard and flown to the school in 1989. There, it served as a classroom aircraft where students learned and practiced aviation maintenance for 25 years. As a result, the helicopter was in good shape. The Coast Guard couldn’t just buy the helicopter back from the school — that would violate policy — but Johanson and others worked with Bill Lucas, ethics attorney at Coast Guard Headquarters, and retired Capt. Norm Schweitzer at General Services Administration, to find a way. 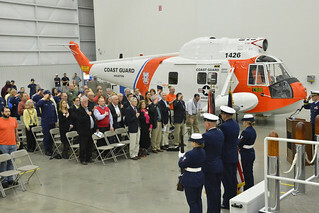 Colors are presented during the opening of a ceremony where HH-52A Seaguard helicopter, tail number 1426 is unveiled at Coast Guard Aviation Logistics Center in Elizabeth City, N.C., Friday, Dec. 11, 2015. 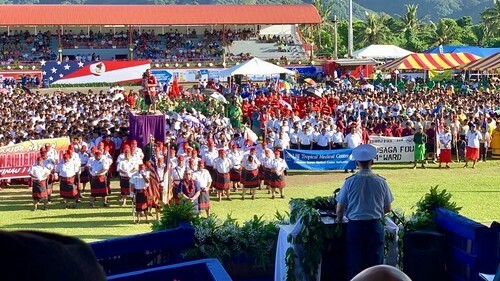 Military services are allowed to trade assets or artifacts with other organizations after considering market value of the objects in question. If what the military wants to give in trade exceeds the value of what the military hopes to get in exchange, that object of lesser dollar value must be determined an historical artifact significant to the military, and the transaction must be approved at several levels. It just so happened, the Coast Guard was retiring the last of its HU-25 Falcon jets, and the school agreed to trade one for its HH-52. The instructors agreed the HU-25 was a better teaching subject for students preparing for careers with airlines. The determination was made that the Coast Guard helicopter was in fact an historical artifact that would well-represent the Department of Homeland Security and Coast Guard’s humanitarian missions. 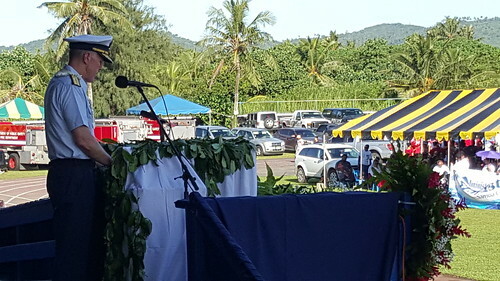 Johanson worked with officials at Coast Guard Headquarters throughout the process to acquire the 1426 in trade for an HU-25 Falcon — a process that began in late 2012 and culminated in 2014 upon approval by the Secretary of Homeland Security. After working out specifics of the trade with the school, the helicopter was transported to the Aviation Logistics Center at Base Elizabeth City, North Carolina. 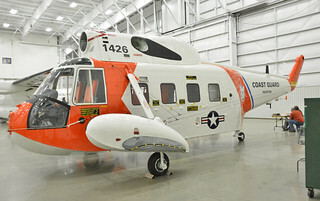 There, 1426 was restored to Smithsonian display standards by contractor Vector CSP under the supervision of CGAA restoration project managers, retired Captains Mont Smith and Ray Miller, and augmented by an HH-52A restoration team comprised of Coast Guard active duty and retired volunteers. Over the course of about nine months, team members supported restoration efforts — repairing and restoring major airframe structures, primary mission equipment and original component identification markings, among many others tasks, to restore the Phoenix to its authentic appearance — as if it were brand new in 1975. Though it took a decade, the people behind Project Phoenix could not have selected a better aircraft to symbolize Coast Guard aviation, nor people to get the job done. 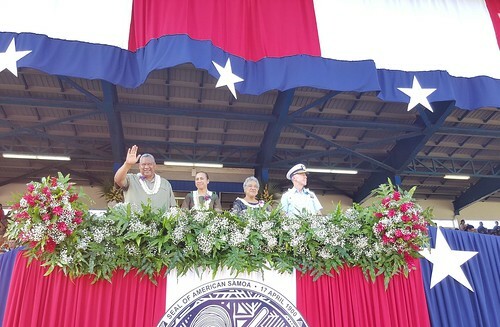 Their hard work and dedication will result in honor and preservation of the service’s rich history, for the enjoyment of future and current Coast Guard aviators, and those who admire them.